While the bike above isn’t my bike (I don’t have any clip of the “before”), it will give you a good idea of the expected outcome. In it you’ll get a good idea of what an air horn sounds like. Not to mention how much louder it is than stock. That’s why a motorcycle horn upgrade is such an awesome mod. Reinstall the fairings and enjoy! Addendum – Will it take the heat? The following list is mainly so you can make sure you have everything available before starting the project. 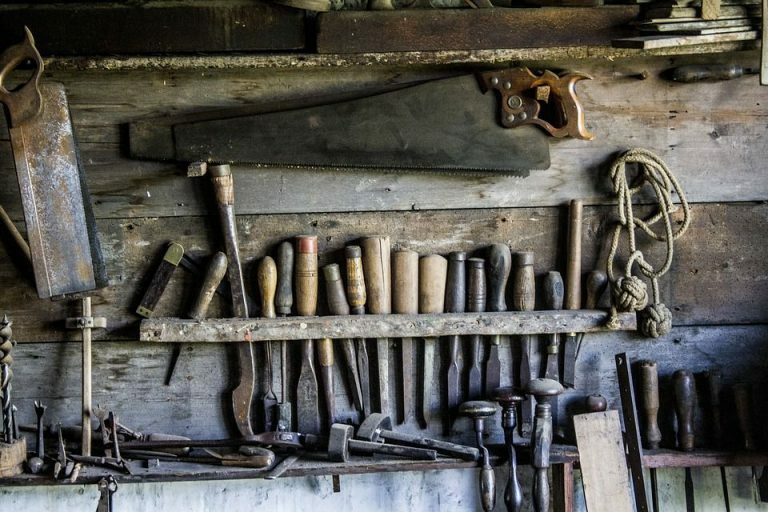 I expect most people to already have most tools and supplies in their garage. Some other typical tools are also needed for this motorcycle horn upgrade mod, like ratchets or wrenches. Items within parenthesis mean useful, but not crucial. 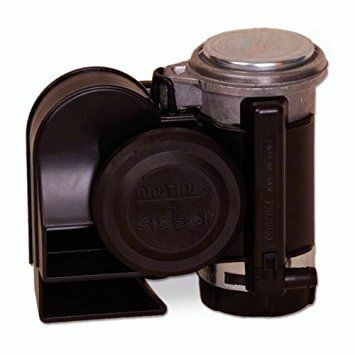 Stebel Nautilus Air Horn – This is one of the best reviewed compact air horns, so it’s what we’ll use in this motorcycle horn upgrade. In theory it puts out 139 dB which is as much as you’re going to get with that footprint. And keep in mind that the dB scale is logarithmic. As in a 139 dB horn is about twice as loud as a 133 dB horn. They also have it in Chrome if that’s your thing. Steel Shelf Bracket – We’ll be using it to fabricate a bracket for the horn. 12v 30 Amp Waterproof 5 Pin Relay w/ Diode – To handle the added amperage of the air horn. You shouldn’t connect the upgraded motorcycle horn directly to the OEM horn wiring. 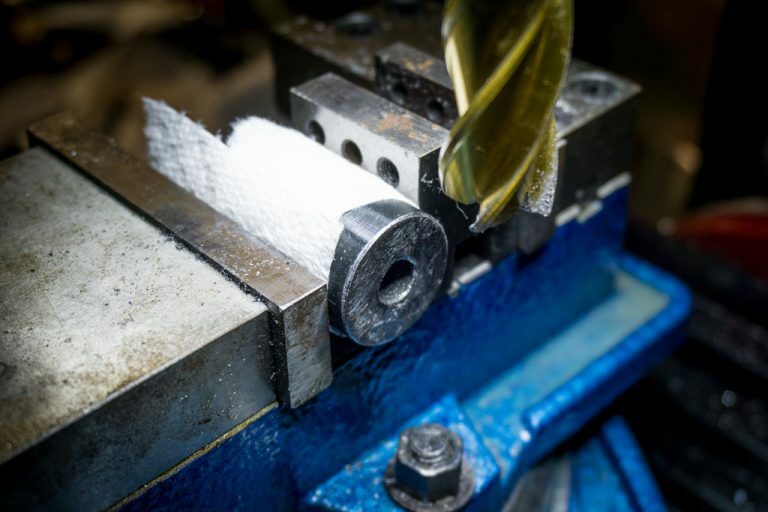 Bench Grinder – To shape the brackets. Caliper – For precision measurements. Using a ruler instead isn’t ideal, but it’s doable. Flush Cutters – These are a godsend for working with the wiring. Multimeter – You saw this one coming, didn’t you? Ratcheting Crimping Tool – If you crimp connectors with any frequency and haven’t ever tried a ratcheting crimping connector, you’re missing out. Get one and you’ll understand why crimping is better than soldering on vehicles. Metal Saw – Or any other saw. I used this for cutting the shelf bracket. Tungsten Carbide Scribe – We’ll use this to mark the cutting points on the metal components. 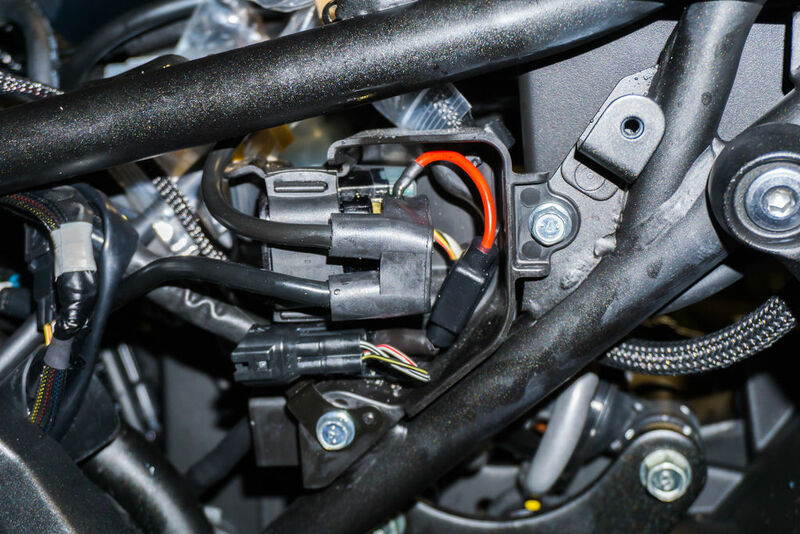 10 or 12 AWG Wire – This will go from the battery terminals to the motorcycle horn upgrade. 10 AWG Waterproof Mini Fuse Holder – To avoid letting the smoke outta the bike. 10mm Drill Bit – To attach the horn to the bracket. 20-40 Amp Mini Fuse – A fuse for the fuse holder. Keep in mind that the air horn takes around 20 amps. Adhesion Promoter – I love this stuff. I’ll be using it later to help keep the adhesive heatshield in place. 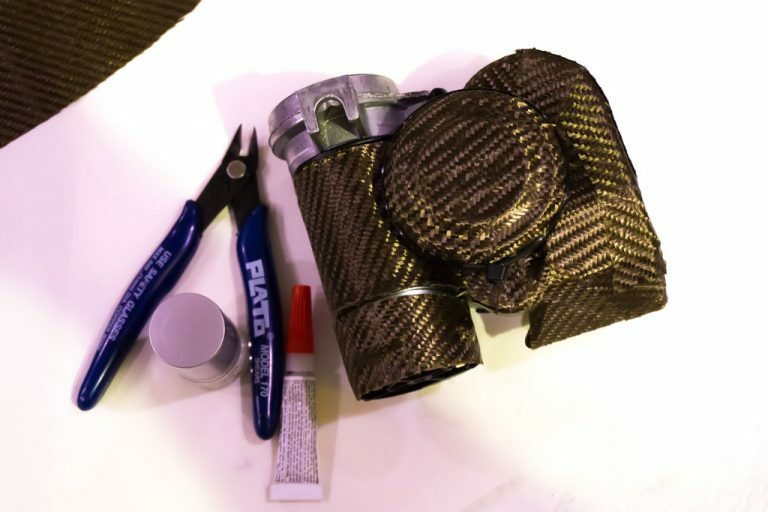 Adhesive Heatshield – Given how close the pneumatic horn is to the exhaust, I’d emphatically recommend this if you want it to last. Blue Threadlocker – What self-respecting DIY would not include some Loctite? (Expandable Braided Sleeve) – Between 2-8mm in diameter, to protect and conceal the upgraded horn wiring. Gun Blue – To recoat the bare metal, protecting it from rust. (Liquid Electrical Tape) – We’ll use this to protect any wiring from corrosion. Terminal Assortment – Spade and ring terminals, mostly. You’ll be using a handful of these. Zip Ties – Used to secure the extra wiring once we finish. All the wiring you will need to access is pretty much on the left side of the bike. 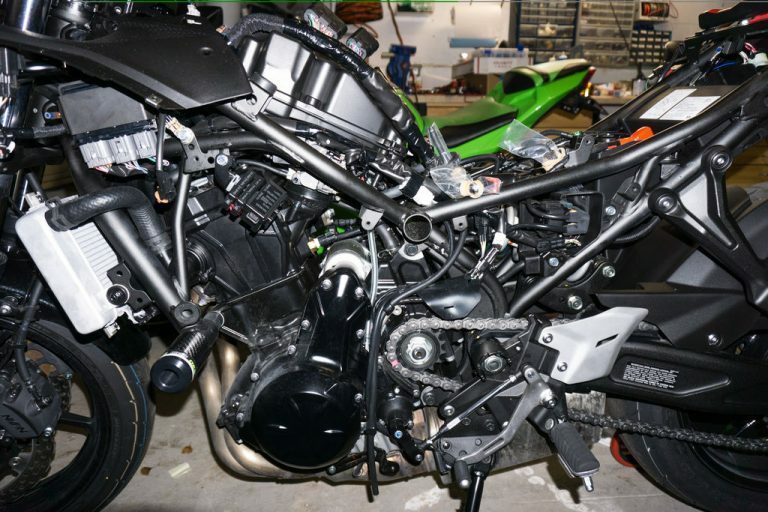 If you are thinking about taking on this project, you probably know everything you need to know about how to remove all the fairings off this bike. So unless you have specific questions (direct them to the comments below), I’ll skip over this part. Removing the tank will also be just about necessary. In any case, removing it is easily and quickly done. Pro tip: Mark your chain with a Permanent Oil Pen to make oiling your chain a lot easier (see picture). That way when you’re lubing the chain, you know where you started, and where to end. Part #92152 is the spacer we will be removing and shortening. It quickly became obvious that there is very, very little space to mount anything, let alone a large aftermarket horn on this bike. I came to the conclusion that the only viable place to install it is attached next to the left engine mount spacer, leaving the horn next to the exhaust pipes. Though not ideal due to that area being pretty hot, it was the only choice. Note: After almost a year, it’s still doing fine so it was not too hot. 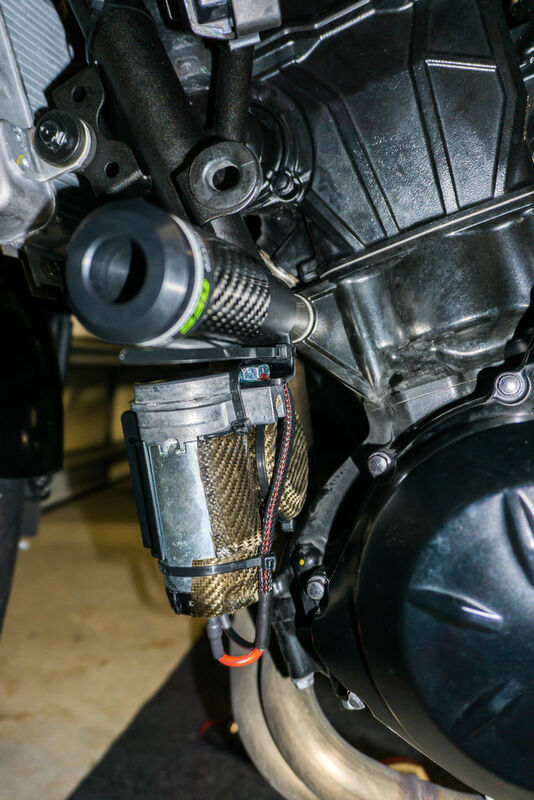 For the motorcycle horn upgrade on this bike, you’ll need to slightly shorten the engine mount spacer so you have space to fit the horn bracket contiguous to the spacer. For that, we’ll first have to remove it. Don’t worry, it’s not too hard once you’ve got the fairings off. The first step is to use a 14mm socket to remove the left engine mount bolt. I personally had some OES Carbon Fiber Frame Sliders installed, which goes mounted in the same location. 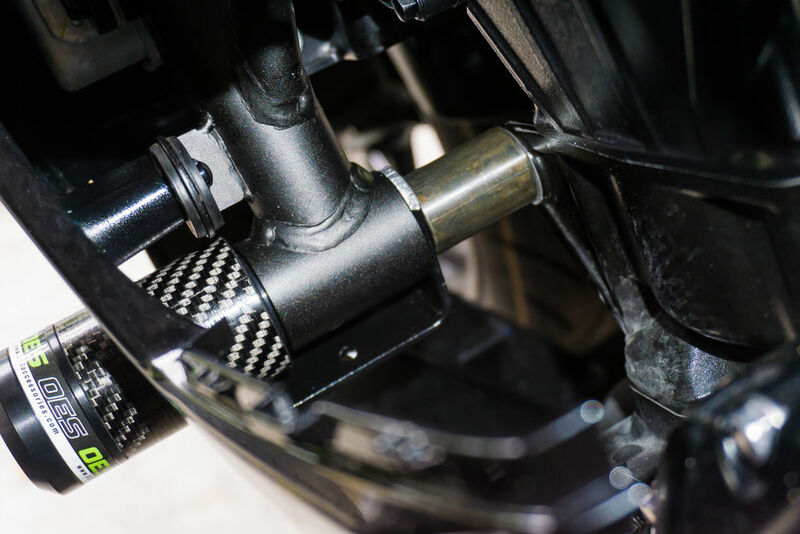 Once you’ve removed the bolt, remove the nut installed behind the engine mount, and remove the spacer (which is simply held in place under friction and light tension). To see more info on how to remove the engine mount spacer, click here. 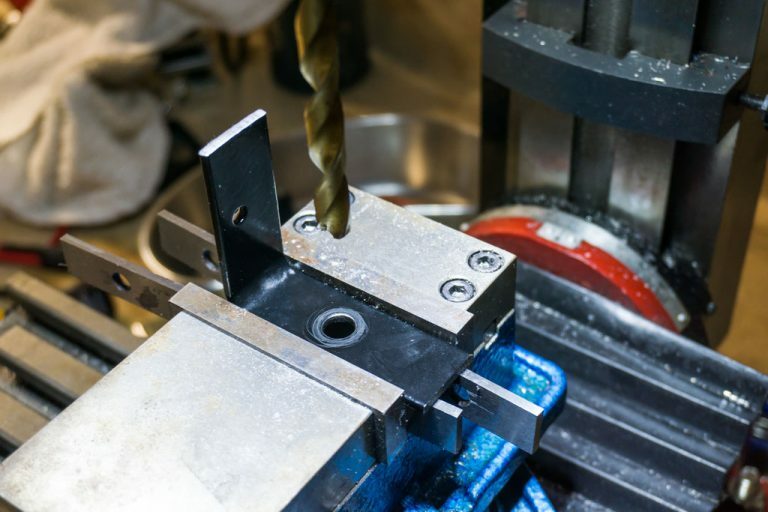 A milling machine is the ideal tool for this project. Or a lathe if you feel like showing off… But if you don’t, a hand saw and a bench grinder would probably do the trick. The engine mount spacer on the left side originally measures 1.575 Inches in length. The Shelf Bracket I was using measured 132 mils (0.132″). If you use a different bracket, measure yours to see what the correct thickness to subtract is. You want to shortened spacer + bracket to measure the same as the original spacer (1.575″). I shortened the spacer to 1.443 inches with a milling machine. If you don’t have one available then you could use an angle grinder with a metal grinding wheel or even a bench grinder. It’s important to make sure that the exact length is achieved, and that the edge is square. This is probably the most PITA part of the motorcycle horn upgrade. So once it’s done, the worst is over. The good news is that if you’re feeling uneasy about screwing up the original spacer, replacements are available online. Also, it’s relatively cheap. It’s part name “COLLAR, 10.5X26X40” and part number 92152-2230. And as time passes and more used replacements are available, the price will only go down. If that wasn’t the case I probably wouldn’t have dared to modify the original spacer. After shortening the spacer break or bevel the sharp edge with a bench grinder or file. Next step. You’ll want to use sandpaper with a grit between 200 and 1000. Liquid gun blue is a quick, cheap way to apply a durable black finish that is rust resistant to steel. The best thing is that unlike paint, it doesn’t have to “dry”. Once you’ve coated the surface, don’t dip the Q-Tip in the bottle again to avoid contaminating it. Once you’re done you’ll have a nice black finish. It looks best after applying oil. First measure (once more) the spacer with a digital caliper to make sure the length was correct (1.443 inches in my case). Then sand the face to remove the machining marks and leave it smooth. In the pictures you can see that I did the sanding on top of a glass pane to make sure that the face was perfectly flat. I used a few different pieces of sandpaper, between 200 and 1000 grit. I hate rust and corrosion, so I always recoat any bare metal edges. In this case, I used some gun bluing to recoat the bare metal edge. Mainly because I didn’t have to patience to wait for paint to dry. This motorcycle horn upgrade is taking long enough as it. Basically it’s just an anodized-like coating which creates a durable layer of protective black rust. The product I used was Birchwood Casey Gun Super Blue. You just have to degrease the surface, make sure it’s smooth (without major scratches or apprentice marks) and then roughen it with some steel wool. Apply the liquid with a Q tip, then wait 30 seconds and wash it off with water. Repeat two or three times until it has a strong black finish. The finish only looks best after applying a coating of oil to it since it slightly absorbs the oil in it’s pores, helping to prevent rust. We’ll convert this shelf bracket into the air horn bracket we need. A deep cut band saw is the best option, but use whatever you have. Given that this is a custom motorcycle horn upgrade, we need a bracket to attach the horn to the bike. I used an Everbilt 10 in. x 8 in. Black Medium Duty Shelf Bracket, with a cost around 5$. I purchased it at Home Depot, where they had an assortment of shelf brackets to choose from. Your best bet is probably to go buy it in person where you can judge easier which would be suitable for you. I personally went with this one since the bracket’s width was equal to the diameter of the engine mount spacer (around 1″ diameter). Also, it was pretty beefy. The first step is to cut the bracket to make it easier to handle. I used a Deep Cut Portable Band Saw. But if you don’t have something like that on hand a reciprocating saw. Or simply a hacksaw. For now just shorten it roughly. Drill the hole which is centered on the bracket up to 10mm. If you’re using the same bracket I’m using, the centered hole on the bracket suits us just perfectly. Drill it to 10mm, which is the diameter of the engine mount bolt. Use a metal scribe to mark the curve of the frame against the bracket. That’s the mark we just made with the metal scribe. For a professional installation, we’re going to want to mark the diameter of the frame mounting point against the bracket with a metal scribe. Simply trace the edge with the scribe. Cut or grind the edge we just marked. Round all the sharp edges with a bench grinder. Once the bracket is shaped, we’re one step closer to finishing this motorcycle horn upgrade. Trim off the excess metal we just marked with the scribe, and then use a bench grinder to break up all the sharp edges. We’re going to install the bracket facing in this direction (aka away from the exhaust). At this point, you’ll want to test fit the bracket for a small morale boost. It should look like this. 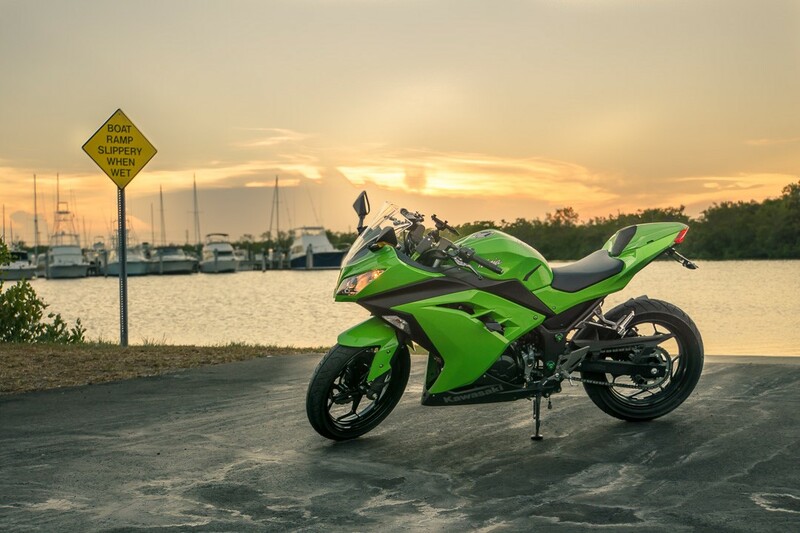 You’re one stop closer to finishing the Ninja 650’s motorcycle horn upgrade. Now we’re just missing a single hole. Locate the center where you will be drilling. Drill an 8mm hole. It will be off center. I ended up mounting the horn as close to the right angle as I could. It seemed the best position, and it would be the strongest position for the bracket. Just hold the bracket against the horn’s top mounting hole and mark it. Then drill. You’ll want to drill the hole slightly too close to the horn. See the next step to understand why. Grind a slight curve in the edge. A bench grinder is ideal for this. Here we can see the light curve. See how the curve matches against the body, with the drill hole aligning perfectly? This is what we want. That way we can securely mount the heavy horn in four dimensions (counting rotation) with a single bolt. A mounting solution that looks like this is our goal. To lock the bracket in four dimensions (including rotation), we’ll want to grind a slight curve in to the side of the bracket. It should match the curve of the silver cap on the horn. This way the bracket will be effectively locked in place despite being held in place by a single bolt. We are also going to have to enlarge the top mounting hole on the horn’s mounting point. For some reason it’s smaller than the supplied bolt. Simply drill it in the same diameter as the bolt supplied with the horn, 8mm. At this point I hope you’re not regretting starting this motorcycle horn upgrade project. Don’t worry, it’ll be worth it once you can honk at oblivious middle-aged women that drive while texting. Boy is it motivating when you finally see it in place. Closer to the exhaust than I’d like, but it’s the best we can do. Test fit the horn, both to make sure we’re on the right track, and for a morale boost. Also, I slightly bent the bracket inwards in a bench vise. This way the horn would be slightly angled inwards, for more clearance with the fairings. You’ll probably know what I mean if you’re following the project. This is reflective lava mat to protect the horn from radiated heat. It won’t do miracles, but it will help. The horn is uncomfortably close to both the exhaust and the engine block.But it’s as good as it’s gonna get on a compact sport bike. We’re going to want to apply a heatshield to protect it. I had some Lava Heatshield Mat leftover from the Cold Air Intake install on my car, so I just used that. Though if I would have purchased some adhesive heatshield specifically for this project, I would have probably ordered this: Thermo-Tec 13500 12″ X 12″ Adhesive Backed Heat Barrier. Mainly because it’s cheaper and thicker. Though it does look less aesthetically pleasing than the lava mat. In any case, you’ll want to install some form of heat shield just to help protect the horn from the heat. Though this motorcycle horn upgrade isn’t the hardest mod I’ve done, I wouldn’t want to do it twice. Take a look at the image to get an idea of how I applied the mat to the back and to the sides. I used a zip tie to secure it to the round portion. I used flush cutters to trim the loose fibers as well as make relief cuts. I also used 3M Adhesion Promoter. It’s a product that I absolutely love for whenever I want to install adhesive products as permanently as possible. After installing everything in place how I wanted it, I applied some superglue to the edges just to secure them permanently. Connect the wire to the topmost terminal. It goes directly to the battery. Once this is done, it’s time to start thinking about wiring. First of all, disconnect the battery terminals. Personally, I hate having a bunch of different accessory wires to connect directly to the battery. In this case, the starter relay has the perfect location and wire gauge to simply hook up the relay’s power wire there. So that’s what I did. I like having a thick gauge wire going to the headlight area for any high power accessories, such as this horn (but also chargers or HID headlights). That’s why I used a 10 Gauge wire. So I could trust that it could handle any current I’d ever want to throw at it in the future. That wire can comfortably carry around 40 Amps continuously (and more) given its short length. That way I know I’ll never have to upgrade it, regardless of future additions to the circuit. You’ll also want to add a waterproof fuse holder here. I’d recommend going with either a 10 or 12 gauge mini fuse holder. Solder or crimp the connection (if soldering, strain relief is crucial) and apply adhesive heatshrink or electrical tape over it. You can also apply some liquid electrical tape before heatshrinking for the best water (read corrosion) protection. Note: Whether to crimp or solder on vehicles is an almost dogmatic topic. If you aren’t familiar, I’d recommend checking out the topic at the previous link. It can easily avoid you a lot of unnecessary troubleshooting in the future. I personally like covering the wires in Expandable Braided Sleeving for a more professional look. Not to mention to protect the wiring from abrasion. 6 to 8mm sleeving is ideal for the main relay wire, with 2-6mm being better for the thinner wires. It’s extremely cheap if you order it on Ebay from overseas. Bring the wire you’ve connected there all the way to the front, to the left side of the headlight. Leave it long just in case you decide to add something to that circuit in the future. Like HIDs. Though for the moment I’m satisfied with an upgraded headlight bulb. 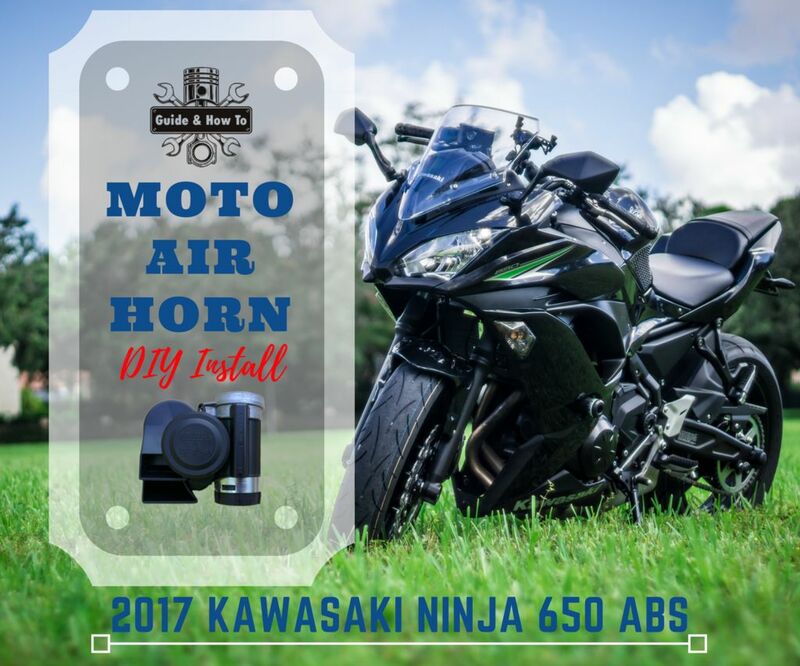 Like it or not, this upgraded motorcycle air horn is going to be demanding current-wise. When it comes to upgrading the horn, the typical question is “Do I really have to use a relay”? In this case, the obvious answer is yes. I measured the current draw of the OEM piezoelectric horn to be 2.5 amps, whereas the Stebel Nautilus air horn draws 19.25 Amps, almost 10 times more than the original horn. So using a relay with a direct connection to the battery is a must when installing an upgraded horn like this. Here is where the OEM horn was installed. I already removed it before taking this picture, but all you need to do is remove the two spade connectors and this bolt. The horn itself has a bracket. Remove it too. Here we can see the OEM horn mounting point from above. This is the OEM horn wiring. 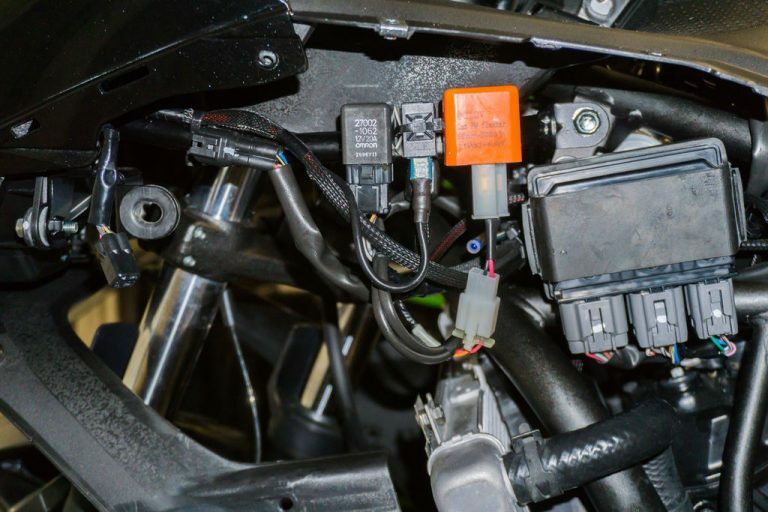 You’ll want to remove the piece of electrical tape as well as the plastic connector holding it in place and route it backwards to the relay area. You’ll want to remove the OEM horn along with its bracket. Also, reroute the wiring which powers the OEM horn to the area where all the relays are on the left side of the headlight area. The horn wires will be used to trigger the new relay. I’d recommend splicing a wire to the 10 AWG wire we brought from the starter relay instead of using that wire directly. Just in case I want to use that wire for other things in the future, like an HID headlight. But you can connect it directly to the relay if you want. Poke out the wire through a gap in the sleeving. Heatshrink it in place. Crimp on a spade connector and fill with dielectric grease for corrosion protection. Use a decent ratcheting crimping tool to secure the spade connector. Splice a wire to the main power wire coming from the starter motor relay. I used 12 AWG Speaker Wire, since no more than that would be needed for the motorcycle horn upgrade. Then I coated the connection with liquid electrical tape and heat shrinked over it. Thread that wire through a gap in the braided sleeve and add some more heatshrink for a profesional look. Finally, crimp on a spade connector to feed the relay. Route the wiring for the motorcycle horn upgrade to where the original relays are. Here we can see how the upgraded horn wiring is routed behind the relay box. Attach the horn’s ground wire here. I didn’t take any pictures of the wiring harness, but it’s pretty straightforward anyway. The wire here is 12 AWG cable. After installing it, I sleeved it with the same braided sleeve as before. Then, I added female spade connectors on the horn side of the wire. Finally, a spade connector plus a ring terminal goes on the bike side. One wire will go to the relay powering the horn, and another to the bundle of grounds already on the bike. See the pictures for more info. 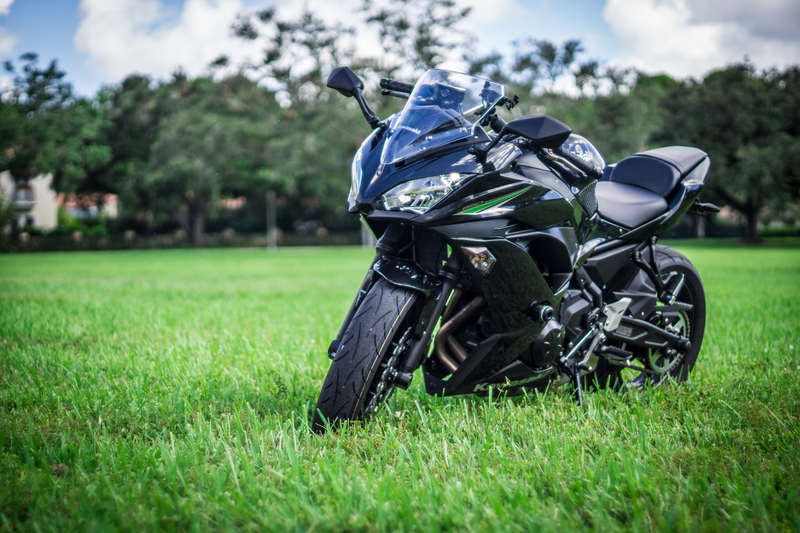 One issue I don’t like about the Ninja 650 is that it uses an odd turn signal relay. It’s expensive and there don’t seem to be any adjustable LED turn signal relays available. Those are the ones that solve LED hyperflashing, and also let you adjust the blinking rate. To be able to use cheap adjustable LED turn signal relays you’ll need an adapter. And as far as I know the only way to get the adapter is purchasing the Motodynamic LED Flasher Relay 12V 2-Prong w/ Connector. Just use the adapter and throw the included relay in your parts bin. That’s how I was able to easily attach a generic adjustable LED Turn Signal relay. It’s the orange relay pictured in the image. I feel like I’m more visible (read safer) when I’m able to adjust my turn signals to blink quickly (though not so much to be considered “hyperflashing”). With the adjustable relay I can set it exactly how I like it. Zip tie the relay for the horn here, between the radiator fan relay (on the left) and the aftermarket LED Turn Signal Flasher Relay (on the right). Install the relay and make the proper connections. I chose a 12v 30a relay 5 pin to pair with the N650’s motorcycle horn upgrade. I like this relay in particular because it’s compact, takes up to 30 Amps, is waterproof, has a diode for protection, and has 5 pins. I’ll spare myself of telling you how to wire it. I can take for granted that this isn’t your first rodeo if you’ve made it this far. Though if anyone needs any help, just mention it in the comments below and I’d be glad to update the DIY. The perfect mounting location for this relay was in the empty spot between the Radiator Fan Relay and the Turn Signal Relay. Said and done. This is how the horn looks once installed and properly wired. Make sure it isn’t touching the engine case and that it’s as far as possible from the exhaust. The motorcycle horn upgrade should now be ready to test! Reconnect the battery terminals and give it a whirl. Hopefully the horn worked on your first try. If not go back and take a look at the fuse. You’ll need at least a 20 Amp fuse. Or inspect how you wired the relay. There isn’t that much to go wrong so you’ll solve it sooner rather than later. Now would be the time to reinstall the Engine Mount Bolt. 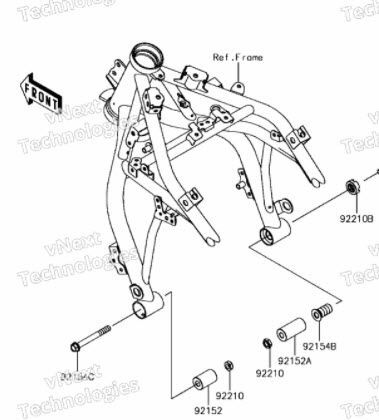 The correct torque for the Engine Mount bolt is 32 lb/ft. Make sure to use a torque wrench. Rotate the Horn Mounting Bracket to the angle you like most prior to torquing it down. I’d like to say that this gap looks smaller than it is. Though not by much. Thankfully, air is an excellent insulator. At least it’s more discrete than two red Hella Supertone horns. Though not acoustically. Once you’ve tested the horn, the only thing left is to reinstall the fairings. Sadly, I didn’t record a before and after of the sound. But you can take my word for it that this is as loud as it gets on a sport bike. It also has that really nice 18 wheeler sound you only get with air horns. 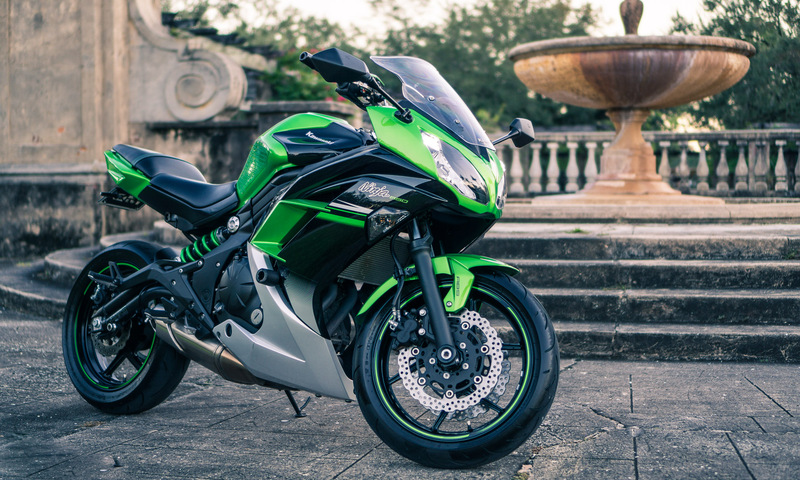 People sure look dumbfounded when they hear the horn and only see a small little sport bike next to them. To see an example of how the horn sounds on a prior model of this bike, click here. To be honest, the horn is uncomfortably close to the exhaust pipes. There is only around a 1 inch gap between the horn and the exhaust. During movement there is no problem, but long idling or stop and go traffic could be a problem. However this is the best that could be done given the situation. I’d like to guess that the horn is designed to take high heat since the engine bay of any given car isn’t precisely cool, so time will tell if the horn let’s us down or not. I considered wrapping the exhaust with DEI 010128 Titanium Exhaust Heat Wrap, which probably would have looked great, but given how controversial exhaust wrap is these days regarding accelerated corrosion, I decided against it. If I see the current horn start to show damage, I will absolutely wrap them. But given that this horn only costs 25-30$, it wasn’t a big risk to take anyway. If the horn fails, I’ll replace it, wrap the exhaust and update. And if I don’t update this, than it is safe to assume that there was no issue. Note on the 4th of June, 2018 – The horn’s still going strong. It can take the heat like a champ.